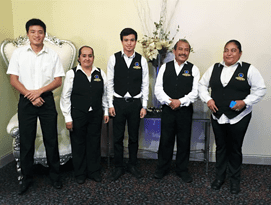 We at Azul Reception hall, Houston, are known by all, for the services offered by our ever friendly staff. They make it a point to make your D-day a memorable one. Food is one of the most important aspects of all events, our experienced servers and wait staff ensure that you enjoy your food and are happy with the service. They make sure that they deliver as quickly as possible, refill your glasses in a timely manner as well as serve the delicacies in proper fashion.